Where are the Best Places to Visit in Huangshan? Situated on the mid-east part of China, Huangshan city enjoys abundant natural and cultural resources. TopChinaTravel would like to introduce some of the most Famous Places in Huangshan, to help you find your way to explore its grand mountain-view, peaceful ancient towns and time-honored architectures that built hundreds of years ago, etc. Located in the south part of Anhui Province, Yellow Mountain is one of the top mountain-view spots of China and known as the No. 1 Mountain under heaven. It features imposing peaks, grotesquely-shaped rocks, steep cliffs, fantastic caves and those peculiarities that make the mountain outstanding among others. Yellow Mountain is celebrated for having all the features of mountain scenery. Located in the south part of Yixian County, only 40km to the south of famous Yellow Mountain Scenic Site, Xidi Village is known for its unique and elegant wooden houses: prettified walls preventing rain infiltration, black tiles recording the history of the town, decorative gate towers standing for the particular flavor of the architecture. 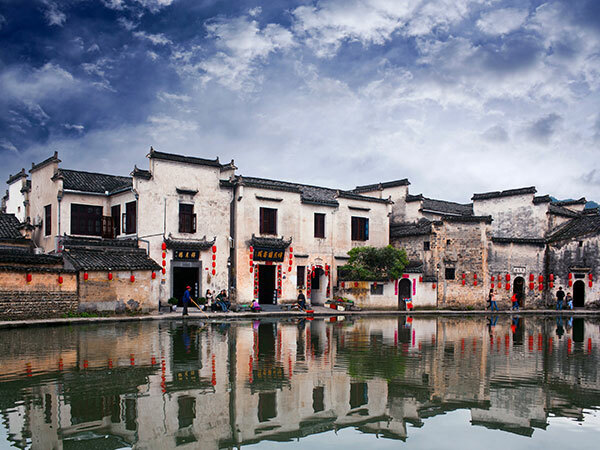 Most of the 300 houses in the village were constructed in the Ming and Qing dynasties, of which 124 were well preserved, fully displaying the architectural style of Anhui Province. The actual history of this village can be dated back to some 900 years agao of the Song Dynasty during the reign of emperor Huangyou. Entering Xidi Village, people will find the obvious road patterns - main road just runs in east-west direction and is flanked by two parallel streets. Numerous narrow alley ways are braches of those major streets which may lead people into a mysterious world to explore further more. Well-arranged lanes, streams and architectures in Xidi are really garden-like scenery. Because of these historic factors, Xidi Village was declared a part of the “Ancient Villages in Southern Anhui” World Heritage Site by UNESCO in 2000. Only 19km away from Xidi Village, Hongcun Village is a special place with cattle-like layout. Located to the southwest of famous Yellow Mountain (Mt. Huangshan), facing the South Lake, the original inhabitants of Hongcun creatively built the amazing artificial water system around the village. Nowadays, the still water reflected the well-preserved Ming and Qing style architectures built along the channel and lake, formed a peaceful and reassuring picture. With marbled ground, black tiles, fresh red lanterns, elaborate woodcarvings and amazingly comprehensive water system, it is known as ‘the folk imperial palaces'. It was inscribed into the list of the World Cultural Heritage Site by UNESCO in 2000. How to plan a trip to Huangshan?